Drowning and doom metal: two things not generally associated with a good time. Sure, drowning can lead to rather poetic ends (like that of Virginia Woolf), and some strains of doom are sometimes equated to good vibes (like stoner doom), but by and large, both D’s tend to be the domain of depressed and dismal downers. Throw in a term like “void,” and forget about it! However, our exclusive track today, the surprisingly jaunty “Drowned in Void” from death/doom gloomy guses Martyrdoom, is easily the most fun you can have drowning in doom metal. Get in here to bang your head while your lungs fill with the sweet liquid of annihilation. The thing that makes “Drowned in Void” far catchier than it has any right to be is the band’s wanton hybridization of the death and doom strains they claim as their sonic heritage. 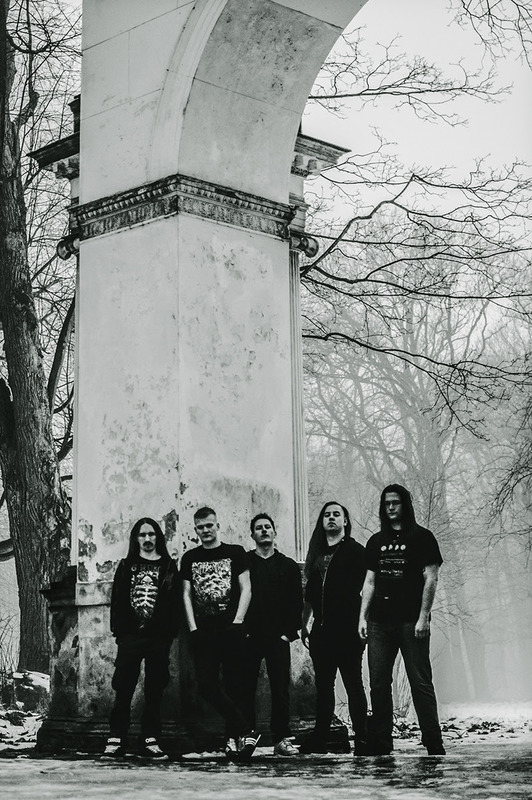 While vocalist Sociak channels his gruffest Martin van Drunen-esque snarls, guitarists Marol and Młynar unleash one monster of a headbanger, replete with zesty little pinch harmonics and undeniable headbangability. Anchoring it all together is the positively seismic rhythm work of bassist Artur and drummer Wasyl. Theirs is an austere, measured approach; rather than drowning you in a cascade of blast beats, Wasyl beats you over the head and neck with caveman cymbal work that could have been lifted directly from the best of Obituary. All the while, Artur hammers and plods his bottom end to fill your lungs with the silty muck of the void. Considered together, each member’s performance alone would be enough to warrant a listen for fans of Hooded Menace and Triptykon, but Martyrdoom ups the ante with an organic, open production that allows those sooty riffs to reverberate and echo in the dankest of sepulchral spaces to absolutely mesmerizing effect. It’s hard not to imagine yourself drowning in the middle of a crypt while listening to “Drowned in Void,” headbanging all the while as you die smiling. Martyrdoom have unveiled another new track called “Betrayed Trust.” You can jam that here while you pre-order the new album direct from Memento Mori here. Make sure you go tell the guys, “Thanks for such a pleasant death” on Facebook. Grievous Psychosis drops April 24th. Photos and stream courtesy of Memento Mori and Transcending Obscurity.